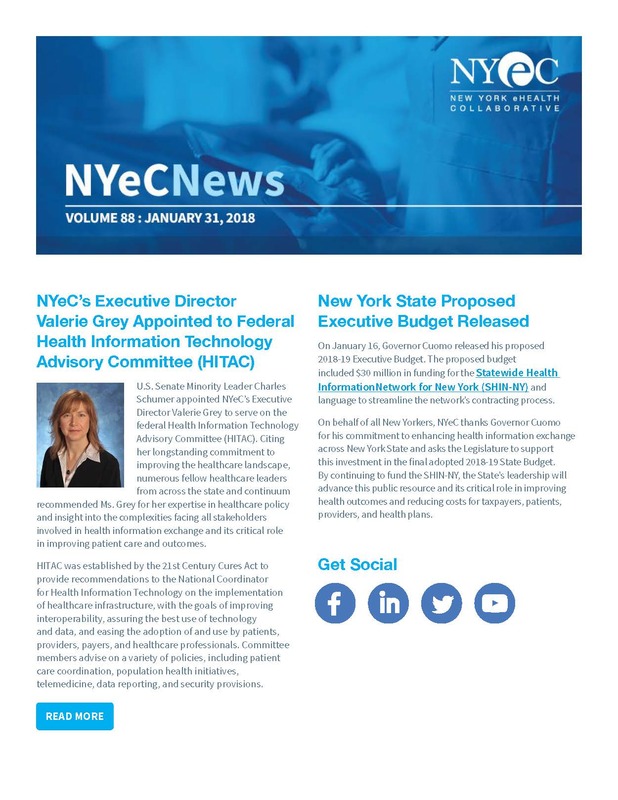 In this month's newsletter, learn more about Executive Director Val Grey's recent appointment to the Federal Health Information Technology Advisory Committee (HITAC), review our recent webinar, "Statewide Health Information Network for NY (SHIN-NY): Its Value to New Yorkers and What Regulated Facilities Need to Know", register with our MIPS Reporting and Support Services, and explore opportunities to join the NYeC team, among other news. Other top headlines in this month's newsletter include news from HealthlinkNY, HEALTHeLINK, new mHealth technologies, and what healthcare industry insiders are watching in the year ahead. Also stay up to date on NYeC’s Healthcare Advisory Professional Services (HAPS) team and learn more about Partner Events and Opportunities.